The last few days, I’ve spent more time on the road than usual. My neighbor’s car was in the shop so I took her where she needed to go (mechanic’s shop, bank, pharmacy, and to work). It was nice to get out with a friend and run around a bit. I miss those day of having a close girlfriend and finding adventures away from home. As I mentioned in the last post, I’ve finished a couple more pairs of socks for my favorite Arkansas family. These first socks were knitted for Jacob. While he was visiting, I found the yarn listed by a favorite indy dyer and he loved it. I ordered it immediately. The yarn is 75% Superwash Merino wool, 25% Nylon in colorway Black Magic. It was purchased from Etsy shop A Guy Two Needles Yarn. The yarn knitted without effort and the socks were made longer for more calf coverage. A basic sock pattern was followed. Jake and I both like how they turned out. I’ve become so comfortable knitting socks, I can darned-near make them in my sleep. The days of making multiple mistakes are over. Horray! As soon as these socks were done, I started making anklets for Stormy. I found a free pattern on Ravelry called Shireen by Rayna Curtis. The yarn was on sale at Simply Socks Yarn Company. It was listed as Mineville Wool Project in colorway Charlotte. I hope she likes them! Though I nearly never wear socks, eventually I’ll knit similar socks for myself to wear to bed on those few particularly cold nights in winter. They look so cozy! I will soon finish another pair of socks for Jacob, then will (hopefully) take a break from sock knitting. I have a pregnant friend for whom I’d like to knit a few items. Baby is due the first week of November so it’s time to get started now. I like the socks you’ve been knitting. Thank you for posting the anklet pattern information. I go to Ravelry, and they have sooooo many patterns I get lost trying to find what I’m looking for. Thanks! I know what you mean about Ravelry. 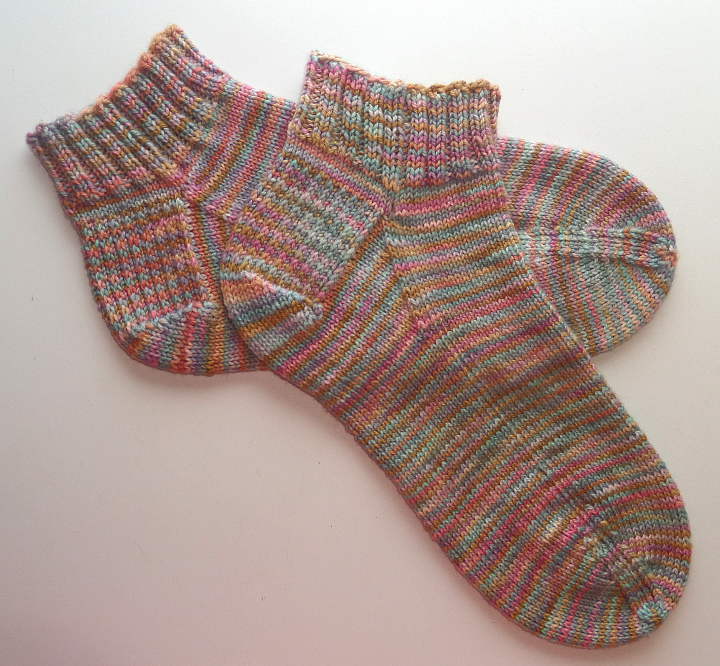 When I first became interested in knitting socks, I spent several evenings going through their free sock patterns. I downloaded and saved dozens I liked. Now instead of going to Ravelry and getting lost for hours, I go to my saved patterns folder and select one. Good luck knitting the anklet. I found the pattern well written and easy to follow. I miss those days too…..Deeply! PS……..Love the socks! Comfy looking, indeed!